This parish contains the villages of Riddlesworth and Gasthorpe. Riddlesworth is situated in the Breckland Local Government district, on the border with Suffolk, some 7km east of Thetford. To the north the parish is bounded by West Harling Heath, to the east by Devil’s Ditch, and to the south the Little Ouse River. The name ‘Riddlesworth’ is derived from the Old English for Hrethel’s enclosure. 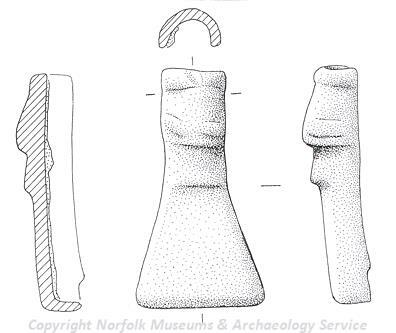 Riddlesworth has a number of objects from the earliest periods of human occupation. These have been recovered from the fields nearest to Riddlesworth Hall School, and include several scatters of worked flint (NHER 6107, NHER 32267, NHER 29318) and a number of Neolithic axeheads (NHER 6108). There have also been a surprising number of objects from the Bronze Age and Iron Age periods recovered from across the parish. These include a sherd of Bronze Age pottery from a double ring ditch (NHER 6109), and more pottery sherds (NHER 29316) from an area near to West Harling Heath, as well as part of a Late Bronze Age spearhead (NHER 36076). Iron Age finds are rare, but an Icenian silver coin (NHER 18459) has been recovered, as well as sherds of pottery (NHER 29013, NHER 29318), and a button and loop fastener (NHER 35094). A number of objects from the Roman period have also been recovered from across the parish. These consist largely of pottery sherds (NHER 6117, NHER 21964, NHER 29010) and a few coins (NHER 12587, NHER 18459, NHER 29318), but bracelet and harness fragments, as well as an exceptional knife handle, have also been recovered (NHER 29013). It is possible that the road that crosses the east of the parish from East Harling to Bury St Edmunds (NHER 6116) has Roman origins, but apart from the very straight route there is no evidence to support this idea. The Saxon period has also left a number of objects in this area, though these are largely limited to pottery sherds (NHER 21964, NHER 29009, NHER 32267). However an interesting Early Saxon copper alloy pendant (NHER 18459) has been recovered from an area just north of the Little Ouse River, and an Early Saxon brooch (NHER 30925) from an area just to the north, as well as a Saxon hanging bowl hook (NHER 36076). Both Gasthorpe and Riddlesworth are mentioned in the Domesday Book, though neither appear to be particularly large or valuable, an interpretation supported by the small numbers and low value of the objects recovered from the Saxon period. However, it is thought that Devils Ditch (NHER 6115) was built during the Early Saxon period, and it may be that this area was more prosperous during the Early Saxon period than the Late Saxon. At the centre of parish life during the medieval period was the church. For the majority of the past, Gasthorpe was a separate parish, only becoming part of Riddlesworth in 1935. As a consequence it had its own church (NHER 6111), dedicated to St Nicholas, the remains of which can still be seen lurking above a copse of trees that now cover its graveyard. Of the remains, the walls of the nave dating to 1100 can be seen, as can the 13th century chancel walls and the almost extant 15th or 16th century tower. 1.5km to the west, the church of St Peter (NHER 6120) is now the parish church for both villages. Although the building has remains dating to the 14th century, the church was thoroughly renovated by Thomas Thornhill in 1855, a member of the family who owned Riddlesworth Hall during the 19th century. As a result the chancel was taken down and completely rebuilt, the nave doubled in size and a south porch added. Also possibly dating to the medieval period are two houses in the Gasthorpe village (NHER 46220), timber-framed buildings that have a 16th century core and laid out in an L-shape. The original Riddlesworth Hall (NHER 6119) building probably predated this, but successive fires and rebuilding have left a building of around 1900, in a classical style, which is now used as a school. There are also a small number of buildings from the post medieval period, and these include 17th century Gasthorpe Lodge (NHER 15498), as well as the main building at Barrack Yard (NHER 15499) which may be as early as the 16th century. Also of interest is the 18th century Old Rectory (NHER 40458), and the 18th and 19th century Old Post Office at Gasthorpe (NHER 41353). A number of objects from the medieval period have also been recovered, the majority of which are pottery sherds (NHER 17779, NHER 21964, NHER 29009) and coins (NHER 15908, NHER 35093, NHER 36076) and metal objects, the most interesting of which is a copper alloy harness decoration of blue enamel (NHER 6110), and a seal matrix (NHER 33932). Similar objects have also been recovered from the post medieval period. From more recent history, the remains of a post medieval limekiln have also survived (NHER 13808) just north of Riddlesworth village, and a single storey flint and brick smithy (NHER 15500) also survives as a house in Gasthorpe. Also of interest is one of the classic K6 type red telephone boxes (NHER 46477), situated at the centre of Gasthorpe. Ruth Fillery-Travis (NLA), 2 April 2007.